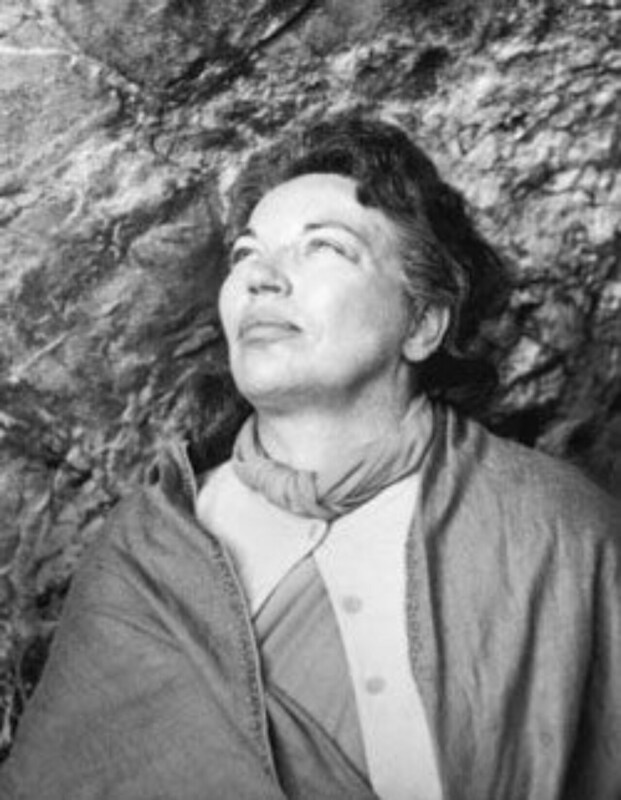 During a visit to Paramahansa Yogananda's ashrams in India (October 1963 − May 1964), Sri Daya Mata made a sacred pilgrimage to a Himalayan cave that has been sanctified by the physical presence of Mahavatar Babaji. For some time afterward, Daya Mata declined in public meetings to speak about her experience. But when, at this satsanga in Encinitas, a devotee asked Mataji to tell of her visit to Babaji's cave, the Divine Will prompted a positive response. Following is her account, for the inspiration of all. From a talk given at Self-Realization Fellowship Ashram Center, Encinitas, California, August 24, 1965. There was a very special relationship between Paramahansa Yogananda and Mahavatar Babaji. Gurudeva often spoke of Babaji, and of the occasion in Calcutta, just before Paramahansaji left India to come to this country, when the Mahavatar had appeared to him. Whenever Master referred to the great avatar, it was with such devotion, such a feeling of reverence, that our hearts were filled with divine love and yearning. I sometimes felt that my heart would burst. After Guruji's passing, the thought of Babaji continued to grow stronger in my consciousness. I used to wonder why, with all due love and reverence for our other beloved paramgurus, there was a special feeling in my heart for Babaji; I was not aware of any particular response from him that might have stirred in me this marked sense of closeness to him. Considering myself wholly unworthy, I never expected to have a personal experience of Babaji's holy presence. I thought that perhaps in some future life this blessing might come to me. Never have I asked for or craved spiritual experiences. I only want to love God and to feel His love. My joy comes from being in love with Him; I seek no other reward in life. When we went to India this last time, two of the devotees with me expressed a wish to visit Babaji's cave. At first I felt no deep personal desire to do so, but we made inquiry. The cave is in the Himalayan foothills beyond Ranikhet, near the border of Nepal. Officials in Delhi told us that the northern border areas were closed to foreigners; it seemed that such a trip would be impossible. I was not disappointed. I have seen too many miracles to doubt that Divine Mother has the power to bring about anything She wills. And if She did not will that the trip be made, I had no personal wish in the matter. A day or two later, Yogacharya Binay Narayan told me he had been in touch with the Chief Minister of Uttar Pradesh, the state in which Babaji's cave is located. The Chief Minister had given special permission for our party to visit the area. Within two days we were ready for the trip. We didn't have any warm clothing suitable for the colder climate of the mountains, only our cotton saris, and woolen chuddars (shawls) to wrap around our shoulders. In our eagerness we were a little foolhardy! We entrained for Lucknow, capital of the state of Uttar Pradesh, arriving about eight o'clock in the evening at the home of the Governor. We took our meal with him, along with the Chief Minister and other guests. By ten o'clock we were on a train headed for Katgodam, accompanied by the Chief Minister. It was almost dawn when we arrived at the little station. From there we had yet to travel by car to the hill station of Dwarahat, where there are accommodations for pilgrims such as we. Sri Daya Mata in deep divine communion at the cave of Mahavatar Babaji, in the Himalayas, near Ranikhet, 1963. "The voice of silence spoke loudly of the presence of the Divine. Waves of realization poured through my consciousness; and the prayers I offered that day have since been answered." For a time I sat in the Katgodam railroad station all alone. The other devotees had gone outside to wait for the cars. With deep feeling and devotion, I was practicing what we call in India Japa Yoga, repeating the name of the Divine again and again and again. In this practice, the whole consciousness gradually becomes absorbed in one thought to the exclusion of everything else. I was taking the name of Babaji. All I could think about was Babaji. My heart was bursting with a thrill indescribable. Suddenly, I lost all awareness of this world. My mind was completely withdrawn into another state of consciousness. In an ecstasy of sweetest joy I beheld the presence of Babaji. I understood what Saint Teresa of Avila meant when she spoke of "seeing" the formless Christ: the individuality of Spirit manifesting as soul, cloaked only in the thought-essence of being. This "seeing" is a perception more vivid and exact in detail than the gross outlines of material forms, or even of visions. Inwardly I bowed and took the dust of his feet. Master had told some of us: "You need never concern yourselves about the leadership of our Society. Babaji has already selected those who are destined to lead this work." When I was chosen by the board, I questioned, "Why me?" Now I found myself appealing to Babaji about it: "They chose me. I am so unworthy. How could it be?" I was sobbing inwardly at his feet. So sweetly, he replied: "My child, you must not doubt your Guru. He spoke the truth. What he told you is true." As Babaji spoke these words, a blissful peace came over me. My whole being remained bathed in that peace, for how long I do not know. Gradually I became aware that the others in the party had come back into the room. When I opened my eyes, I beheld my surroundings with a new perception. I remember exclaiming, "Of course! I have been here before." Everything was instantly familiar to me, memories of a past lifetime reawakened! The cars that were to take us up the hill were ready. We got in and traveled up the winding mountain road. Every sight, every scene I beheld, was familiar to me. After the experience at Katgodam, Babaji's presence remained so strong with me that everywhere I looked, he seemed to be there. We stopped briefly at Ranikhet, where we were received by officials of the town who had been notified of our visit by the Chief Minister. Finally we arrived at the remote little village of Dwarahat, perched high in the Himalayan foothills. We settled in a government rest house, a simple little bungalow for pilgrims. That night many people came from the surrounding countryside to see us. They had heard of the pilgrims from the West who had come to visit the holy cave. Many people in this region talk about Babaji, whose name means "Revered Father." They plied us with questions, and we had satsanga together, just as we are having now. Many of them understood English, and someone nearby translated for those who didn't. After satsanga was over and the villagers had dispersed, we sat for meditation and then retired, climbing into our warm sleeping bags. In the middle of the night I had a superconscious experience. A huge black cloud suddenly swept over me, trying to engulf me. As it did so, I cried out to God, awakening Ananda Ma and Uma Ma, who were in the room with me. They were alarmed and wanted to know what had happened. "I don't want to talk about it now," I told them. "I am all right. Go back to sleep." Through the practice of meditation, the all-knowing power of intuition develops in each one of us. I had intuitively understood what the Divine was telling me through this symbolic experience. It foretold a serious illness I was soon to undergo; and it also indicated that all mankind would face a very dark time during which the evil force would seek to engulf the world. Because the cloud did not completely envelop me — it was repulsed by my thoughts of God — the vision signified that I would come through the personal danger, which I did. Similarly, it showed that the world also would ultimately emerge from the threatening dark cloud of karma, but mankind would first have to do its part by turning to God. The next morning at nine o'clock we started on our trek to the cave. For this part of the journey we had to walk most of the way, but could occasionally ride on horseback or in a dandi. This is a little palanquin-like carriage of roughly hewn wood, suspended by rope from two long poles, which are borne on the shoulders of four male porters. Upward we walked, walked, and walked; sometimes we literally crawled, for in many places the way was very steep. We stopped only briefly at two rest houses along the way. The second one was a government bungalow where we would stay overnight on our return from the cave. Around five in the afternoon, just as the sun was beginning to set over the mountains, we arrived at the cave. The light of the sun, or was it the light of another Power? veiled the whole atmosphere and all objects in a shimmering golden glow. There are in fact several caves in this area. One is open, hewn by nature out of a giant rock, perhaps the same rocky ledge on which Babaji was standing when Lahiri Mahasaya first saw him. Then there is another cave; to enter it, you must crawl on your hands and knees. This is purportedly the one in which Babaji stayed. Its physical structure, especially the entranceway, has been altered by natural forces during the passage of more than a century since it was occupied by Babaji. In the inner room of this cave we sat for a long time in deep meditation, and prayed for all devotees of our Gurus, and for all mankind. Never before has stillness said so much. The voice of silence spoke loudly of the presence of the Divine. Waves of realization poured through my consciousness; and the prayers I offered that day have since been answered. As a memento of our visit, and a symbol of the reverence and devotion held by all of Gurudeva's chelas for the divine Mahavatar, we left in the cave a small scarf on which the Self-Realization emblem had been sewn. After dark, we started our homeward trek. Many villagers had joined our pilgrimage, and a few had thoughtfully and wisely carried along some kerosene lanterns. Voices were raised in songs to God as we wended our way down the mountain. About nine o'clock, we arrived at the humble home of one of the officials of this area, who had accompanied us to the cave; here we were invited to rest. We sat around a blazing fire outside the dwelling, and were served roasted potatoes, black bread, and tea. The bread is baked in ashes, and is as black as can be. I'll never forget how good that meal tasted, in the crisp night air of the holy Himalayas. It was midnight when we reached the government rest house where we had stopped en route to the cave. Here we were to spend the night — what was left of it! Many people remarked to us afterward that sheer faith brought us through that area at night. It is infested with dangerous snakes, tigers, and leopards. No one would dream of being out there after dark. But it is said that ignorance is bliss, and it did not occur to us to be frightened. Even if we had known of the dangers, I am sure we would have felt secure. But I wouldn't generally recommend that this journey be made at nighttime! Throughout the whole day, the experience I had had with Babaji at Katgodam was part of my consciousness; there was also the constant feeling that I was reliving scenes from the past. That night I couldn't sleep. As I sat in meditation, the whole room was lit suddenly with a golden light. The light became a brilliant blue, and there again was the presence of our beloved Babaji! This time he said: "My child, know this: it is not necessary for devotees to come to this spot to find me. Whoever goes within with deep devotion, calling and believing in me, will find my response." This was his message to you all. How true it is. If you only believe, if you just have devotion and silently call on Babaji, you will feel his response. Then I said, "Babaji, my Lord, our Guru taught us that whenever we want to feel wisdom, we should pray to Sri Yukteswarji, because he is all jnana, all wisdom; and whenever we want to feel ananda or bliss, we should commune with Lahiri Mahasaya. What is your nature?" As I said it, oh, I felt as though my heart was going to burst with love, such love — a thousand million loves rolled into one! He is all love; his whole nature is prem(divine love). Though unvoiced, a more eloquent response I could not conceive; yet Babaji made it even sweeter and more meaningful as he added these words: "My nature is love; for it is love alone that can change this world." The presence of the great avatar slowly vanished in the diminishing blue light, leaving me joyously enwrapped in love divine. I remembered what Gurudeva had said to me a short time before he left his body. I had asked him, "Master, usually when the leader goes, an organization no longer grows but begins to die out. How will we carry on without you? What will hold and inspire us when you are no longer here in the flesh?" Never will I forget his answer: "When I have left this world, only love can take my place. Be so drunk with the love of God night and day that you will know nothing else. And give that love to all." This is also Babaji's message — the message for this age. Love for God, and for God in all, is an eternal summons that has been preached by all the spiritual giants who have graced this earth. It is a truth we must apply in our own lives. It is so essential at this time, when mankind is uncertain of tomorrow, when it seems that hate, selfishness, greed, could destroy the world. We must be divine warriors armed with love, compassion, and understanding; this is what is so vitally needed. So, my dear ones, I have shared this experience with you so you might know that Babaji lives. He does exist, and his message is an eternal one of divine love. I am not referring to the selfish, narrow, personal, possessive love of ordinary human relationships. I mean the love that Christ gives to his disciples, that Gurudeva gives to us: unconditional divine love. This is the love we must give to all. We all cry for it. There is not one of us in this room who doesn't long for love, for a little kindness and understanding. We are the soul, and the nature of the soul is perfection; so we can never be fully satisfied with anything that is less than perfect. But we can never know what perfection is until we know Him, the Perfect Love, the Father, Mother, Friend, and Beloved: our God.